to supply the cozy winter fires. 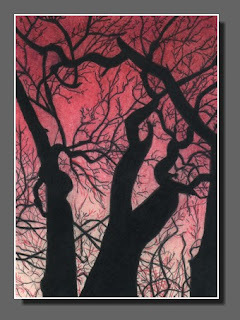 This is another Artist Trading Card, 3.5 x 2.5″, for the upcoming Art Fair, done in Ink and Colored Pencil. It’s part of an ongoing Silhouette Sky series. This is beautifully done! Good luck with your art fair. Wow! This is beautiful. It looks like a carved wood block print. Thanks so much Bec and Jana! I just keep plugging away, trying to get one ATC done a day. I’ve not done a wood block print yet, that’s something I’d really like to try someday.